Plants are champion synthetic chemists! They take advantage of their metabolic prowess to produce an extremely large repertoire of structurally diverse natural products, also referred to as secondary or specialized metabolites. Classes of specialized metabolites have extensively diversified across plant taxa, thereby suggesting that particular metabolic systems have been recruited through natural selection when the set of compounds that they produce address specific ecological needs. Interaction with insects is one of the many selection pressures thought to have sculpted plant metabolism and many specialized metabolites directly protect plants against herbivore attacks. Timely increases in the production of particular specialized metabolites in response to insect attack additionally benefits plants by decreasing the costs of constitutive metabolite production. Trade-offs between defense metabolism and the intrinsic growth-related functions of central metabolic pathways likely also provide important selection pressures that maintain natural metabolic polymorphisms. The overarching objective of our research is to understand the defensive function against insects and evolutionary history of case study plant specialized metabolism pathways. 1) The contribution of allopolyploidy events on the evolution of key metabolic innovations in plants. Half of the species of the Nicotiana genus are allopolyploids. We are notably investigating species from the section Repandae as new model systems for testing the rapid diversification of defense metabolic pathways. N. repanda, N. stocktonii, N. nesophila and N. nudicaulis which colonize different habitats in the USA and Mexico are derived from a single ancient allopolyploidy event with N. sylvestris and N. obtusifolia being the closest parental genomes. Our preliminary metabolomics work has shown reconfigurations of the herbivory-induced signaling networks and metabolomes in these allopolyploids (Figure 1). Importantly, old literature reports supported by our analysis demonstrate that three of these species have evolved a new type of trichome-specific defense metabolites extremely toxic to herbivores called N-acyl nornicotines. This provides an ideal phylogenetic framework for testing how (allo)polyploidization contributed to the emergence of gain-of-function defense metabolism traits, something which, to our knowledge, has never been rigorously tested. Importantly, closest parental genomes are sequenced and we are collaborating to the analysis of N. obtusifolia as well as N. attenuata genomes. Taking advantage of these resources, we are currently integrating tissue-specific RNAseq transcriptome, metabolome and bioinformatic analyses to retrace gene-mediated effects in the evolution of defense metabolism in these species. This combined omics effort is also applied to other cases of allopolyploidy within the genus of Nicotiana to infer some of the basic principles shaping microevolutionary innovations in signaling and defensive pathways to herbivory. Figure 1. Specialized metabolism diversification in allopolyploids of the sub-section Repandae revealed by MS-based metabolomics. Left panel, Sectional classification modified from Knapp et al. (2004) of the genus Nicotiana highlighting allopolyploids of the section Repandae. Right panel, Comparative MS-based metabolomics of allopolyploids and closest ancestral species. 2) The development of next generation computational metabolomics to facilitate hypothesis generation on specialized metabolism evolution. Plant cells are capable of producing an incredibly large spectrum of functionally diverse metabolites, of which many secondary metabolites have still unknown functions. Yet, this impressive metabolic complexity is still hardly exploited, notably since the underlying metabolic pathways have not been investigated. We are interested in accelerating the process of gene function discovery using an integration of transcriptomics and MS-based metabolomics. 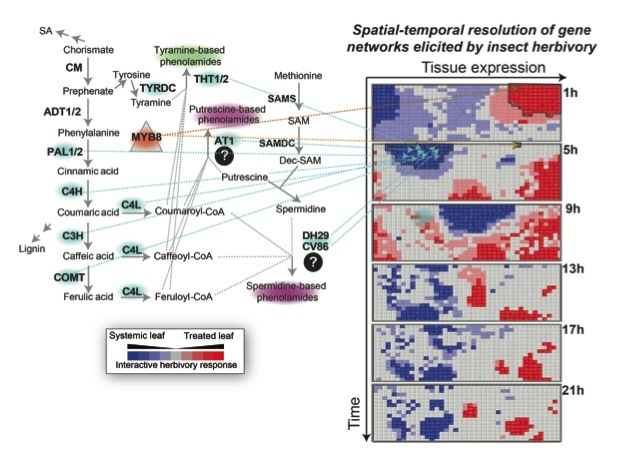 Using multifactorial analysis of integrated transcriptomics-metabolomics time series and self-organizing maps, we designed an efficient approach to produce cartographies of transient tissue-specific GRNs and gene-metabolite co-dynamics during insect herbivory (Gulati et al., 2013) (Figure 2). Another critical aspect lies in the identification of unknown metabolites that exhibit significant associations with a phenotype of interest. Non-targeted approaches for rapidly collecting repertoires of MS/MS data can be extremely powerful in capturing the metabolic diversity expected across plant species. There is a clear need for workflows that combine biological information and MS metabolomics data. Ideally, such workflows should comprehensively capture quantitative and structural information on as many detectable metabolites as possible (“metabolic space”) and generate data-rich visual outputs to facilitate hypothesis formulation (see Li et al. PNAS 2015). Figure 2. A multifactorial co-expression analysis of systemically induced secondary metabolic pathways (adapted from Gaquerel et al. 2014). Self-organizing maps are used to cluster genes according to their tissue and time behaviors inferred from multifactorial statistics. Bait genes (here from the phenylpropanoid metabolic pathway) are used to identify clusters of interest for stress adaptation.